Ubisoft’s arcade racer doubles down on a lack of excitement. Arcade racing games used to be everywhere around the turn of the century. As tastes and the video game market have changed, the supply of such games is pretty thin these days. Ubisoft has produced a new sequel to their 2014 open world racing game, The Crew, in an attempt to fill the arcade racing void in the market. To up the ante from the first game, boats and airplanes have been stirred into the mix of land vehicles, creating an all you can eat buffet of motorized fun. At least, I think it's supposed to be fun. After forcing myself through hours of underwhelming races, I feel that The Crew 2 wants to be a Ferrari F40 when it's actually a Pontiac Aztek with some Monster Energy stickers and an oversized spoiler glued on. While I missed out on the The Crew when it first launched, I later acquired the game from a giveaway on Ubisoft’s uPlay platform on PC. I jumped in with a group of friends and spent a good amount of time with the game, mostly enjoying its open world recreation of America as the canvas for various races. I really disliked the way the cars handled and how progression was structured, but I was able to look past those things because the game was free and it was a reasonable first attempt with some decent ideas. I ended up purchasing both of its expansions, Call All Units and Wild Run (I guess Ubisoft’s giveaway of the base worked after all), though I never really played either of them. When I heard the announcement of the sequel, The Crew 2, I was cautiously optimistic. 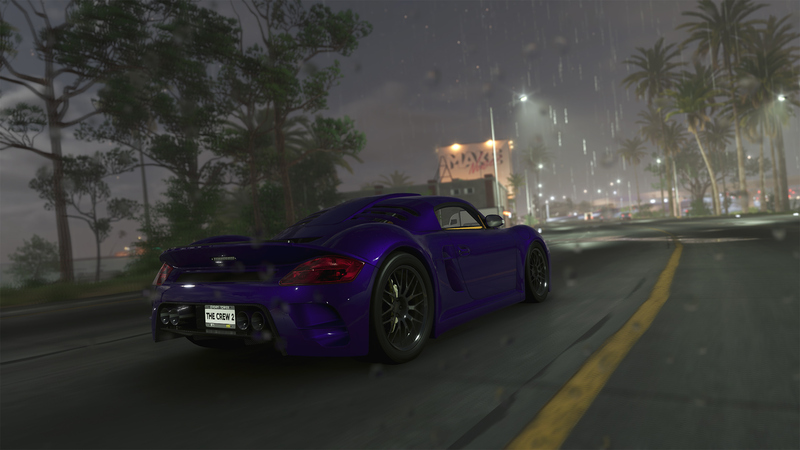 If the studio could re-work the driving model to feel like it rewarded skill and make the cars feel unique, The Crew franchise could begin building towards something special. Once I sat down with the game, I found that Ubisoft has doubled down on the lifeless driving and added in some truly insipid flying and boating. The huge map is unquestionably the star of the show, but the Crew 2 never offers you an exciting way to traverse it. The first Crew game offered a cliched, yet mildly interesting story where your brother was murdered by illegal street racers and you had to work your way into these street racing gangs by going undercover with the help of law enforcement. It served its purpose as a reason to keep pushing through multiple motorsports disciplines and their associated events. Your character wanted to gain street racing credibility as a means to be welcomed into the illegal race gangs. For The Crew 2, the stakes have been raised to towering heights. You are seemingly a random person and all you yearn for is attracting social media followers and to impress random folks in the racing subculture. No dead brothers, no drive for vengeance, and no reason for the player to care. The presentation is slick, but it’s something we’ve seen countless times in racing games, going back as far as the Dirt series. The opening encounters of the game introduce you to the driving, boating, and flying mechanics. The early events tease a cool Inception-esque world bending mechanic that is never seen again. Each of these modes of transportation are pretty bland on their own, although the game does offer a cool transitional sequence that lets you swap between all three types of vehicles on the fly. You can be 1000 meters above sea level in your plane and then seamlessly warp into your boat or car. The non-flying vehicles will simply drop out of the sky. It’s nonsensical, but fun. Coming up with clever ways to traverse the environment or set up stunts while swapping between vehicles is very cool and much more fun than any of the structured events presented by the game. While the game map is enormous, there is very little reward for moving across it in your vehicles. The game pretty much lets you warp anywhere you want in a flash. As someone who was frustrated by the boredom from the race events, I appreciated that the developers did not force me to waste time driving (or flying or boating) to the next event. While there are open world skill challenges scattered around the map that can be triggered while moving about in the free roaming mode, I found myself warping to them just like any other event. Your enjoyment of the events themselves will be dependent on how much you enjoy the game’s driving, boating, or flying mechanics. While I disliked most events, I did find fun in a few, such as the Circuit discipline races. Sadly, I could only play two of this race type (in very short 2-3 lap events) before I was forced to go back and fly or boat my way through events that were excruciatingly boring. You have to keep plowing through the various events (or side quests like photography) to earn an arbitrary amount of social media followers so that you can get the chance to unlock another pair of races you actually want to do. I eventually worked my way up to social media ICON, which unlocked almost all events, but by that time, I wanted the whole experience to be over. The Crew 2 surprised me by increasing my level of disappointment as I progressed through the game. I made note of the Hypercar discipline early on in my game and worked to gain enough social media followers so that I could get access to races with some of the most exciting cars in the world. Once I unlocked the series, I discovered that the Hypercar events were possibly the most boring part of the game. Rather than clever circuits or street races designed to provide white knuckle action, Hypercar events are overly long road trips that involve almost no turns, almost no AI traffic, and are only good at making you forget that you are piloting a Ferrari. Racing ridiculously expensive supercars near 200 mph has never been so dull. I got so bored during the first Hypercar race that I decided to record the event after it had been going on for seven minutes. I assumed no one would believe me, so I needed video proof. I uploaded the recording to Youtube for you to watch (at your own risk) below. I’ve mostly focused on the driving parts because I found the boating and flying stuff to be even worse. If you’ve played popular open world action games before, you’ve probably experienced races in these type of vehicles that were more exciting. The boating in particular is awful, as the game sometimes has water physics that affect you and other times not. You can drive over another boat’s wake and get tossed up or slowed down and other times the wake is just an alpha effect you move right through like a ghost. Sometimes your boat just slows down to a near stop for no reason. Fun stuff. Even worse is that I found no way to customize races to my liking. I’d like to try running hypercars through the early street racing courses or take the rally cars onto the stunt events, but I was never able to find out how to make that work (if it even is possible). Graphically, the game is not too bad, especially compared to the first Crew. The quality of the lighting is greatly improved from the first game and the game map carries better vegetation and minor details. There are moments when the dynamic day/night cycle produce eye-catching vistas, but it’s not unfair to say that The Crew 2 is a step down visually from similar titles like Forza Horizon 3. The vehicle models are generally well done and serve their purpose. According to tests conducted by Digital Foundry, the game is locked to 30fps on all consoles (though the Xbox One and PS4 will have occasionally drops below). The PS4 Pro and Xbox One X get resolution bumps (up to 1800p on the One X) and additional details or longer draw distances. I played the game on PC, allowing for the framerate to be set up to 60fps. Like the original game, there is no way to take advantage of refresh rates above 60Hz. I played with an Intel 7700K CPU and GTX 1080 Ti GPU and found I had to turn down some settings to get a stable 60fps at 1440p resolution. While I found the larger experience to be underwhelming, the game does offer some high points. Moving around the game map and fast traveling is instantaneous and seamless. While I didn’t find the game’s menus to be as functional as I’d like, they all look really sharp and fit within the game’s aesthetic. While music tastes are subjective, I found the included soundtrack to be very well done (as it was in the first Crew game) and it made some of the less exciting races more tolerable. Swapping between vehicles works very well and is probably the coolest part of the game. 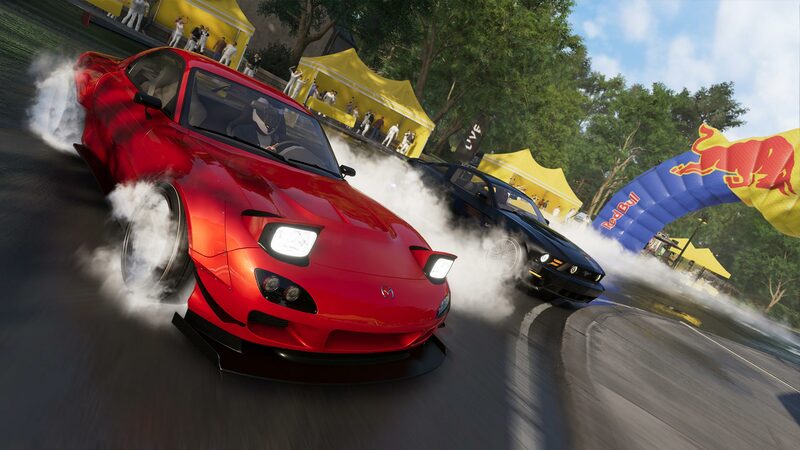 I had hopes that The Crew 2 could build on the excellent open world map from the first game and offer a strong arcade racing competitor to the Forza Horizon franchise. Unfortunately, this didn’t happen. 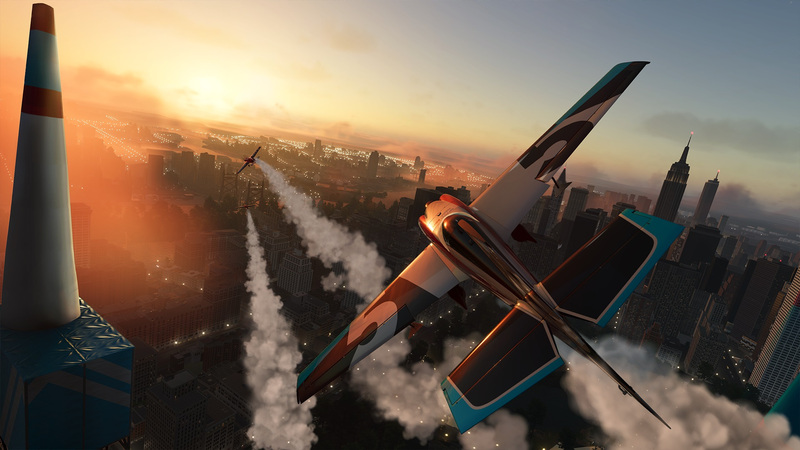 I feel that The Crew 2 fails at providing the heart of what what a racing game should offer, specifically a fun and rewarding driving experience. All the icing and fancy decoration in the world won’t make a crappy cake into a great cake. The Crew 2 can take a pack of exotic cars racing on a mountain road and produce results that are about as exciting as a round of solitaire. This review is based on the PC uPlay release. The game was provided by the publisher. The Crew 2 was made available for PC, Xbox One, and PS4 on June 29, for $59.99.